Established in the year 2005, we, Instronix Process Controls, are a reputed manufacturer, exporter, trader and supplier of process control equipment that are used in numerous industries. The products manufactured by us are highly appreciated by the clients, and well received in the domestic market. Our expertise also lies in providing complete process control application for the client's benefit. Our organization is headed by Mr. Divyang Patel, who possesses rich industry experience, and directs us in the successful completion of all endeavors undertaken by us. He is driving force behind our pursuit of excellence and inspires us to provide the clients best-in-class products. 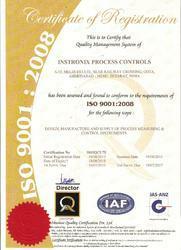 Manufacturing of Process Control Equipments. Manufacturing of product which meets highest quality and safety norms. They continuously try to improve the products, increase their knowledge base and enhance their skills. Our strong position in this highly competitive industry is attributable to their hard work & diligent efforts.